My post at The Daily Blog this week ignores all the political kerfuffle surrounding milk-stained cabinet ministers taking holidays from twitter, and focusses on a new report from non-partisan young climate activist group Generation Zero: A Challenge To Our Leaders – Why New Zealand needs a Clean Energy Plan. It’s an impressive piece of work, and an admirable summary of where we are today and where New Zealand should be heading. I commend it to all Hot Topic readers – the pdf is here. Kathryn Ryan’s interview earlier this week with Michael Eckhart, Managing Director and Global Head of Environmental Finance and Sustainability at the giant investment bank Citigroup was arresting. 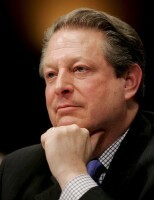 He was in New Zealand as a keynote speaker at the Wind Energy Conference and Ryan asked him about a recent report from Citi, Energy Darwinism: The Evolution of the Energy Industry, which claimed the world is entering the age of renewable energy and explored the consequences for generators, utilities, consumers and fossil fuel exporters. There’s a good exposition of the report on this blog post. Eckhart explained the three big costs in producing electricity – the fuel, paying off the loan for the plant, and operational maintenance. In the case of coal and natural gas generation all three costs are involved and there’s no way of knowing what the cost of the fuel will be in the future. With wind and other renewables “there is no fuel cost at all: none”. Once the loan for the plant is paid off there are no further costs other than operational. 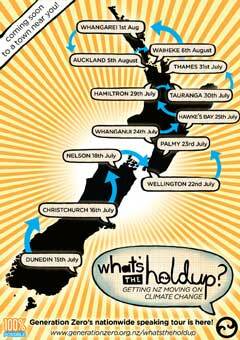 Generation Zero’s NZ speaking tour asks: What’s the holdup? In between extreme weather and rising oil prices, countries around the world are making a shift towards renewable energy – but New Zealand is lagging behind. Tackling climate change for many Kiwis feels like an impossible task. But together, we can create the movement to change this and bring forth a thriving New Zealand we are proud to hand on to future generations. The facts say that it’s 100% Possible to move beyond fossil fuels – but we need leadership at every level, from entrepreneurs and business leaders, from communities, and from the politicians we elect. Generation Zero will initiate a conversation with the country. New Zealanders young and old are invited to hear young people and experts talk about the solutions to climate change, and what each one of us can do to make a difference. It’s 100% possible to create a thriving New Zealand beyond fossil fuels. So what’s the holdup? All events start at 7pm. For more information, sign up here. Author GarethPosted on July 19, 2013 July 19, 2013 Categories Climate politics, environment and ecologyTags emissions, fossil fuel, Generation Zero, NZ, renewable12 Comments on Generation Zero’s NZ speaking tour asks: What’s the holdup? If Rio Tinto Alcan pull the plug on Tiwai Point, a future government will have the perfect excuse to simplify the electricity system, cut electricity prices and deliver a low-emissions future for us all. High time our politicians faced up to the fact that market-based business as usual is no recipe for our electricity future (or any other, for that matter).